BEIJING, Jan. 14,Chinese President Xi Jinping and his visiting Finnish counterpart Sauli Niinisto agreed to work together to write a new chapter in bilateral ties during their talks on Monday. Hailing that China and Finland have been committed to forging a future-oriented new-type of cooperative partnership in recent years, Xi said it is not only in line with both countries' and people's interests but also conducive to world peace, stability and prosperity that China and Finland enhance dialogue and cooperation. The two countries need to adhere to mutual respect and trust, be open-minded and inclusive, respect each other's development path and take each other's core interests into consideration so as to promote the steady development of bilateral ties, Xi told Niinisto during the talks held at the Great Hall of the People. Xi encouraged both countries to expand cooperation in new areas driven by innovation. China appreciated Finland's support to the Belt and Road Initiative, said Xi, adding that the country is ready to work with Finland to enhance Belt and Road cooperation. He suggested the two countries make the best use of the China Railway Express and other facilities to boost two-way trade, conduct third-party cooperation, discuss opportunities for cooperation on the Arctic shipping routes and jointly build the Polar Silk Road. Xi also called for enhanced cultural and people-to-people exchanges as the two presidents would jointly launch the 2019 China-Finland Year of Winter Sports in the hope of forging a model of winter sports cooperation. The two countries need to jointly promote the reform on global governance, enhance cooperation on international affairs, push forward the establishment of the open world economy, safeguard the multilateral trading system, and implement the Paris Agreement on climate change, Xi said. Stressing that China has always supported the European integration, Xi said China hopes Europe will maintain unity, stability, openness and prosperity and play an active and constructive role in the international arena, calling on Finland to continue contributing to China-Europe ties. On the Arctic affairs, Xi said China stands ready to work with Finland to enhance cooperation under the framework of the Arctic Council and boost the sustainable development in the Arctic region. China will also maintain close contact with Nordic countries and the Nordic Council of Ministers to develop cooperation between China and Nordic countries, Xi said. Hailing the rapid development of bilateral ties, Niinisto said that Finland speaks highly of China's achievements, values China's role in international affairs and cherishes its friendship with China. The Belt and Road Initiative proposed by Xi is very important, he said, adding that Finland is willing to play a positive role to better align this initiative with the European Union (EU) to promote the connectivity of the Eurasian continent. 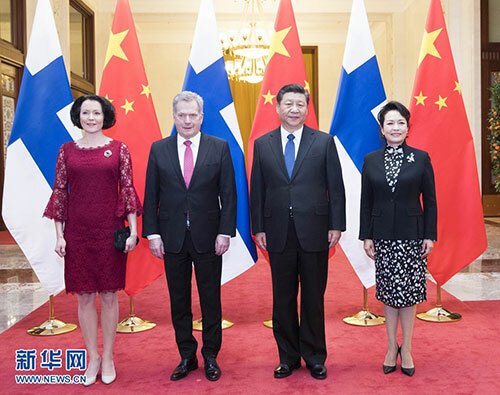 During Niinisto's visit to China, the two sides are scheduled to publish a joint action plan (2019-2023) on promoting the future-oriented new-type cooperative partnership between China and Finland. Finland is ready to work with China to implement the action plan, strengthen pragmatic cooperation in areas including trade, innovation, environment, tourism, and Arctic affairs, boost people-to-people exchanges and cement cooperation on sports, particularly winter sports, Niinisto said. It is important for the two countries to maintain close communication and coordination on international affairs under the current situation, he said, adding that Finland applauds China's positive role in tackling climate change and safeguarding the multilateral trading system. Finland will assume the rotating presidency of the EU in the second half of this year. The country will take this as an opportunity to promote closer ties between the EU and China, Niinisto said. After the talks, the two presidents witnessed the signing of cooperation agreements and attended the inaugural ceremony of the 2019 China-Finland Year of Winter Sports. During the 1952 Helsinki Olympic Games, the People's Republic of China made its debut at the Olympic Games, and for the first time China's national flag was raised at the Olympic arena, Xi said. There is huge potential for cooperation on winter sports between the two countries given the high complementarity, Xi said while addressing the inaugural ceremony. "I believe the 2019 China-Finland Year of Winter Sports will boost the two countries' sports cooperation, inject new vitality to people-to-people exchanges, and further advance the future-oriented new-type cooperative partnership between China and Finland," Xi said. Finland supports China in hosting the 2022 Beijing Winter Olympic Games, Niinisto said, adding that he is glad Finland will be the first country to launch the Year of Winter Sports with China and he believes this will further promote friendship between the two countries. China is on its way of becoming a big power in winter sports and Finland is willing to lend a helping hand, Niinisto said. Niinisto is paying a state visit to China from Sunday to Wednesday at the invitation of Xi.